Ellis Patents Centaur cable saddles have been designed as a solution for cleating large diameter high voltage cables used in National Grid Power Transmission Systems typically 132kV, 275kV and 400kV. Centaur cable saddles provide a solution to cable cleating large diameter EHV power transmission cables from 100mm up to 162mm outside diameter generally installed within high voltage cable tunnels. Cable saddles are designed for supporting high voltage cables with diameters from 100mm to 162mm from support steelwork at centres of up to 8.4m. The cable saddles have been short-circuit tested at 63kA RMS for 1 second. Design - Centaur high voltage cable saddles consist of an extruded and pressed aluminium saddle and a hinged aluminium overstrap. The ends of the cable saddle are flared so that the cable never comes in contact with a sharp edge and the overstrap incorporates an LSOH polymeric liner, which cushions the high voltage power cable in the event of a short-circuit. All the fixing bolts are in 316L stainless steel. To eliminate the possibility of galvanic corrosion all dissimilar metals are isolated from each other by injection moulded separation washers. The cable saddles are available in lengths of 400, 600 & 800mm to allow for different cable diameters and mounting centres. Mounting Options - Centaur high voltage cable saddles are almost unlimited and are project specific. 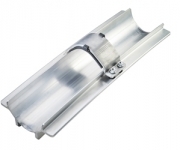 The high voltage cable saddle can be directly fixed to lugs welded to the supporting structure or may be supported on a bracket made from aluminium or galvanized steel. Centaur may be installed rigidly or in such a way to allow it to pivot vertically, horizontally or both. (Observations of cable movement during short-circuit tests suggest that the latter option would be preferable). Testing - Centaur high voltage cable saddles and intermediate straps were short-circuit tested at KEMA in Arnhem Holland in July 2008, using the commonly recognized National Grid requirement of 63kA RMS for a minimum of one second as an objective. Tests were passed on both three phase and phase to phase faults at 63kA RMS, 163kA peak. A copy of the full independent report from KEMA is available on request. Centaur has also been successfully tested for corrosion resistance having been subjected to an independent salt spray test carried out in accordance with BS EN 9227:2006 Corrosion tests in artificial atmospheres. Ellis Patents has launched a project specific testing service that it says will remove any uncertainty about the ability of cable cleats to do the cable containment job they have been specified for. The leading cleat manufacturer had previously gone on record calling for compulsory third party certification of all cleats, but says that a lack of understanding about the process has resulted in cable cleat products continuing to be incorrectly specified. Ellis Patents commented: “Third party certification really should clear up any doubts about a cleats ability to withstand the maximum force it is likely to experience in any given installation. The problem is that the quoted short circuit withstand, which is seen as the indicator of a cleats suitability for a project, is only valid for a cable diameter equal to or greater than the diameter of the cable used in the test. Intended to wipe out this issue, Ellis Patents new service provides specifiers and contractors with the opportunity to test the cables and cable cleats they intend to install in the most-extreme short-circuit conditions likely to occur in the final installation. A procedure that means the tested cleats can be granted project specific third party certification and be installed with confidence. Ellis Patents project specific testing service is part of its on-going commitment to short circuit testing and third party certification. Ellis Patents currently spends a minimum of one allocated day every six months at a specialist facility where it tests its new or enhanced products prior to bringing them to market, and seeks to validate claims made by other manufacturers.